Owning shares in a real estate investment trust (REIT) is one way to passively invest in real estate without directly owning property. REIT shares were valued at 6,853 in December 2018, below the 7,146 index value experienced a year earlier. REIT shares have declined slightly after reaching a historic peak in August 2018. Right now, REIT values are still bolstered by the strength of the multi-family market — with high occupancy rates and continued demand in the commercial and industrial sectors. However, REIT investors need to be wary of rising interest rates, which has driven down share prices in 2018 and will continue to be a burden on REITs in the years ahead. Updated January 28, 2019. Original copy released April 2010. For investors, real estate valuation is based on capitalization (cap) rates – which vary greatly over an extended period of time. Consider that cap rates, by design, rise (and fall) in sympathy with long term interest rates. The zero lower-bound rate trough we hit in 2012 introduced the start of a 30-year half cycle of rising interest rates, beginning in 2013. The parallel movement of cap and interest rates will drive down the value of REIT real estate holdings in the open market. Meanwhile, REIT rent revenues will steadily increase at near the pace of consumer inflation. The primary driver of rent increases, consumer inflation is managed at 2% by the Federal Reserve via their monetary policy. changes in personal income levels. None of these influences are guided by property values or cap rates. However: to properly set cap rates for evaluating a property, they need to factor in a risk premium rate to reflect the effect of these influences on rental income. Real Estate Investment Trusts (REITs) are the point at which the stock market and the real estate market collide. REITs are one way for individuals to invest in real estate, especially income-producing real estate, without purchasing and operating the property themselves. Stock market investors look to REITs when they want to dip their feet into the field of income-property ownership without subjecting themselves to the liabilities of ownership and oversight burdens of property management. An ownership investment in a REIT does not resemble real estate ownership as we know it. In fact, shares in a REIT have much more in common with stocks than with property in terms of risk and merit. At the moment, 14 REITs are featured in the Standard & Poor’s (S&P) 500 stock market index. For stock market investors, REITs serve as a form of diversification, spreading the risk inherent in the management of a particular REIT among the broad pool of its shareholders. Investors appreciate the diversity of REIT investments, since each REIT typically owns multiple properties. Also, an investment in several different REITs is closely equivalent to the purchase of fractional ownership interests in numerous different properties, all under different management. But what exactly is a REIT, and how does it differ from other forms of syndication better known to the local real estate markets, such as the limited liability company (LLC)? REITs are essentially property owning corporations. Unlike publicly-held corporations, however, they avoid paying income taxes through a tax loophole by passing a minimum of 90% of their earnings on to investors, in the form of dividends, not passive real estate income as is the case with an LLC. However, in both REITs and LLCs, income, profits and losses are passed through to the individual members according to their share in the ownership of the entity. The end result for REITs is a greatly restricted ability for management to receive compensation for just about anything involving fund raising, representations, management fees or allocation of assets and cash reserves. 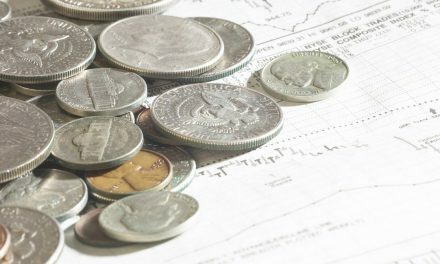 In search of alternative income for their REIT involvement, members of REIT management often work as real estate brokers to take the big front-end fees paid when their REIT purchases or sells large assets — risky behavior that may be good for management, but has negative long-term ramifications for REIT investors. Problems of asset value arise when REITs buy property at prices that deliver low annual rates of return. While low annual returns are acceptable to stock market investors, they are not acceptable to real estate investors. Stock investors are accustomed to buying and selling business shares at price-to-earnings (P/E) ratios (multipliers) that would never be acceptable to prudent investors in the real estate marketplace. Unlike businesses, which are all comparable to one another, parcels of real estate are unique, and their value cannot easily or quickly be judged by comparison or pre-set formulas. After all, businesses can logically grow, relocate, add or change products, and remain profitable for centuries, since they are not destined for eventual obsolescence as property improvements are. Further, businesses are generally not subject to the demographic forces that influence the value of each and every parcel of real estate. Due to the immobility of a property’s location, pricing of that property fluctuates over time with the relocation and shifting of that population’s demographics. Unlike a business marketing a product, a parcel of real estate cannot move to follow the users and buyers. When REIT managers fail to consider these uncertainties, they stand to make purchases at unrealistically inflated prices. REIT investors may applaud a purchase at what seems like a good rate of return for an investment in the stock market, but while informed property investors will sell at these inflated prices, they refuse to participate as buyers. Put simply: real estate values differ when viewed solely through the stock market’s “window of opportunity” rather than through experience in the real estate market’s actual process of evaluation. The multiplier of the price-earnings (P/E) ratio (its reciprocal) used in the stock market to price many investments in REITs can be traced back to the operating structure and method of ownership in these entities. The participants who invest in REITs are called shareowners. The shareowners hold transferable shares, which have a high level of liquidity since they can be quickly sold publicly on stock market exchanges. As shareowners, individual investors are not liable for the debts and obligations of the REIT, closely comparable to membership interests in an LLC. The REIT is managed by officers called trustees who also are not liable for the debts and obligations of the REIT — a condition comparable to the manager position in an LLC. REITs are unique among real estate investment vehicles, since participation in them by investors is subject to the benefits and drawbacks of stock in a publicly-traded corporation. REIT investors are thus affected by stock market issues like short-term interest rates and spurts of inflation. Worse, they are simultaneously subject to the capitalization issues of the real estate market that affect the setting of property values. It’s a trade-off that many stock-market investors are happy to make, thanks to the convenience of owning stock, especially when that stock can be spread over many REITs. Of foremost importance to shareowners is a simple trade-off: in exchange for taking on the risks that come from the lack of control in REIT ownership, shareowners can diversify their real estate-based investments. The investor thus avoids the need to conduct a due diligence investigation into the value of the underlying real estate. Investors are also freed from worrying over the income and operating costs of owning a property. Such factors, while of primary importance to a real estate investor owning and operating a property, do not concern investors in REITs. No formulas, rules of thumb or guidance exist for REIT investors to make a quick analysis of value and pricing of REIT shares. Investors thus tend to apply the P/E ratios commonly used to evaluate stock issued by corporate enterprises and sold through the stock exchange. They can be, for portfolio stock market investors willing to do their research. 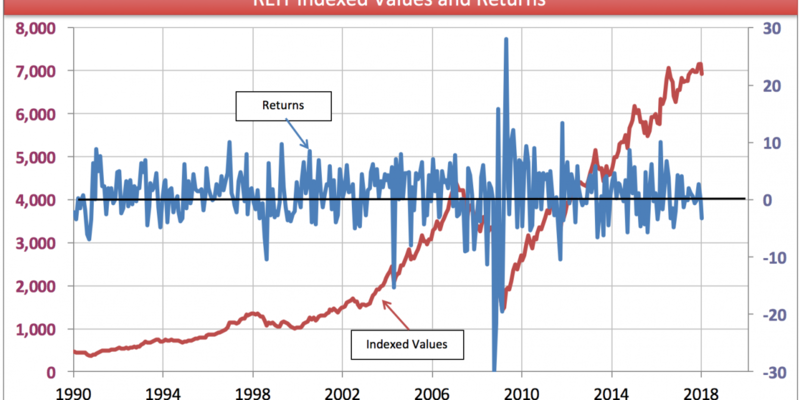 However, as indicated by the indexed values in the above chart, REITs are slave to the movements of the larger economy, having plunged during the 2008 recession. 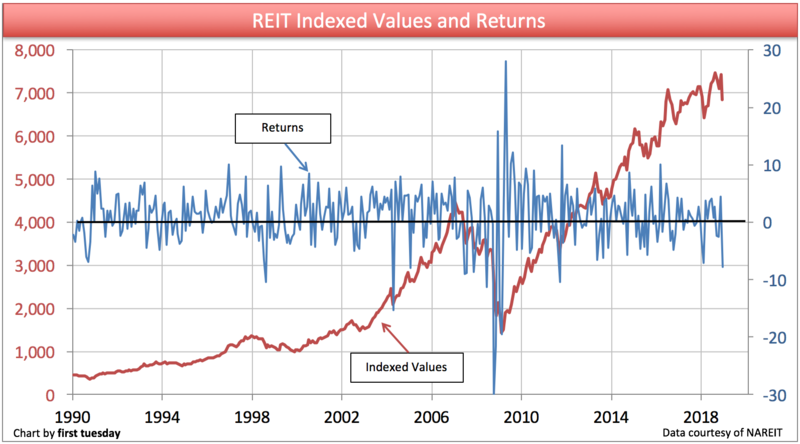 As part of the rise in the stock market since then, the gain in REIT share values is fueled by ambitious speculators. But REITs still lack support from underlying earnings and property values, which have a long way to go before recovering past value —unlike the present situation in stock market pricing. The strength of the REIT market as a whole can be gauged in part by the strength of the commercial real estate market: publicly traded REITs hold around 10% of the nation’s commercial real estate. For the present, however, the commercial real estate market has only begun to recover from the recession. The optimistic stock market investors who choose to invest in REITs under the expectation of a quick real estate recovery will be unpleasantly surprised by the results. This is not to say that REITs will remain unable to eventually produce a full recovery for their shareholders. While commercial property is in dire straits, some REITs used the 2008 recession and prolonged recovery to acquire additional cash by issuing more certificates of participation (stock, by a different name) with the intention of using the cash generated to purchase property at reduced market prices. This means the capitalization rates of the share pricing for REIT investors will be nearly back to the real estate market norm of 9-10% (after dropping as low as 5% in the 2005 REIT purchasing frenzy). Those who invest directly in real estate ownership today may experience a better fate. first tuesday does not anticipate any sort of bottom in the commercial real estate market in the near future. Readers who follow the movement in the number of jobs existing, returning and newly created in California have already come to the same conclusion. As of September 2016, REIT shares have more than quadrupled from their low point in February of 2009, despite that commercial real estate values continue to struggle. July 2016 also marked a new 40-year high for REIT shares. Cautious and uninformed investors prefer to purchase bundled shares of assorted REITs, mirroring the market as a whole instead of trying to pick individual winners. This approach requires less research, and by its diversification reduces the cumbersome due diligence investigation associated with purchasing any individual REIT. These investors may benefit from the historical information and timely reports available from the National Association of REITs (including the market data depicted on the chart above). The REIT’s management. Management must have a history of operating property responsibly, not just buying and selling for the sake of short term gains. Purchases must be accomplished without losing cash capital to fees loaded on the front end of deals, and property management must be accomplished in an effective and efficient manner. If possible, the investor should analyze the REIT’s income reports to get a feel for its historic use of cash and property. The location and type of property owned by the REIT. This information can be had on the REIT’s operating statements. Perhaps most useful, for those willing to do the research, are the REIT’s annual reports made to the United States Securities and Exchange Commission (SEC). Specialty REITs include diversified property types, and produced more than twice as many returns than non-specialty REITs in 2011. These property types include self-storage buildings, movie theaters and data storage centers — all of which have fared well during the recession and recovery. The SEC requires all REITs to report the number of properties they own, the number under construction, the amount invested and details about the property’s type, as well as other information about the REIT’s activities and objectives. The report, which may run over fifty pages, lists potential risks to the REIT and its investors, details the trust’s level of insurance and provides a broad picture of the trust’s position in the market. 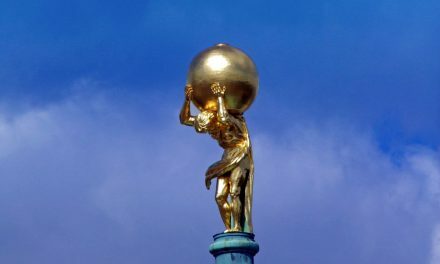 If there is one thing that buyers have learned from the end of the residential and commercial bubbles, it is that there are no sure bets in real estate. The best insurance against a mistake is always knowledge of the market and the individual properties involved. This is true of homeownership (for which there is no ability to diversify)and direct ownership of income property, and it is equally true of indirect ownership through a REIT. NextPOLL: How did 2018 tax changes affect home sales volume?